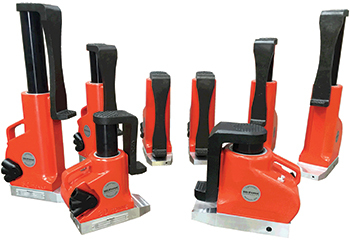 Hi-Force, the UK’s leading manufacturer of high pressure hydraulic tools and equipment has announced that it has taken over all the manufacturing rights, to produce a wide range of lightweight aluminium jacks, previously manufactured and sold under the Astro brand. The deal, concluded in August 2015 was announced by Hi-Force Group managing director, Kevin Brown who says: "For many years Hi-Force has been marketing our own range of JAH series lightweight aluminium jacks, under an own brand agreement with Astro. However, following the retirement of the owner of Astro, Hi-Force decided to start negotiations to purchase the manufacturing rights of this longstanding and well established range of products." Following negotiations between Hi-Force and Astro it was agreed that Astro would sell off the assets, of the jack manufacturing part of their business to Hi-Force and this was completed in early August, this year. As part of the deal, four Haas CNC machines and associated tooling were transferred from Astro facilities in Birmingham to the Hi-Force manufacturing plant in Daventry, Northants, where they are now producing component parts under the strict quality control of Hi-Force. The Hi-Force range of JAH Series lightweight aluminium jacks currently comprise of 18 models, available in 20, 30 and 60 tonnes lifting capacities, with a choice of 152 mm or 305 mm lifting heights and options like claw attachments for "toe lifting" and mechanical lock rings, for sustained load holding. Predominantly made of lightweight aluminium, the design of these jacks makes them useful in a wide variety of industries including aerospace, railways, defence, steel and aluminium plants and heavy industries worldwide. Expressing his delight at a further significant expansion of Hi-Force in-house manufacturing capability, Brown adds: "Once we get production into full swing by mid-September 2015 and we are able to offer our global customer base, product from stock, I am confident that our sales of this highly popular range of products, will continue to grow at a healthy rate. Secondly, we are well advanced in the planning and design of additional models, to add to the range, particularly focussed towards the aerospace industry, where we see tremendous potential." Additionally, Brown says that customers who previously bought jacks from Astro, either under the Astro brand name or as own-branded product are welcome to contact Hi-Force to discuss any future requirements that they may have for lightweight aluminium jacks and/or spare parts.